February is the last month of meteorological winter, but astronomical winter doesn’t actually end until March 20th at 5:29 AM CDT. The traditional midpoint of winter is on February 2nd. Most people call this day “Groundhog’s Day,” but it is also known as “Candlemas Day,” the Christian festival of lights. February is generally a sunnier month than January, featuring 50% of possible sunshine on average, compared to only 41% for the first month of the calendar year. Just in case you are wondering what is the sunniest month of the year, it is May, which features 66% of possible sunshine on average. On average for February, fog that reduces visibility to 1/4 mile or less only occurs on one day during the month. By the beginning of the month, Central Alabama is really starting to feel the move toward spring. Average temperatures start off at 55 degrees for highs, and 35 degrees for lows. By the end of the month, temperatures have risen quite a bit, with 62 degrees for average highs, and 40 degrees for average lows. 9.7 nights, on average, drop below the freezing mark in Birmingham for February… less than the January number of 14.9 nights. 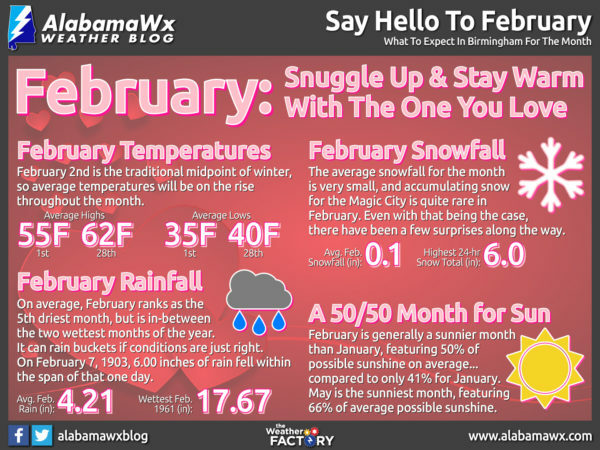 The coldest temperature on record for the city of Birmingham occurred on February 13, 1899, during a huge cold wave. The official low of -10 degrees was taken at the U.S. Weather Bureau Office in Fountain Heights, but would have been -14 degrees if it had been taken at the current official observation station at the Birmingham Airport. The warmest high temperature for the Magic City of 83 degrees, was recorded on three different days (February 8th, 1918, February, 13th 1962, and February 23rd, 1996). As far as precipitation for the Magic City, February is the middle month in the wettest three month period on average. During this “rainy season,” Birmingham usually receives over 15 inches of rain. On average, 4.21 inches of rain falls in the city for the month, but it can be pretty rainy at times as well. The daily record for the month of 6 inches of rain, fell on February 7, 1903. A whopping total of 17.67 inches of rain fell during the month in 1961, which is the wettest February on record. It can be relatively dry here as well. Only a meager 1.20 inches fell during the month in 1968. On average, it typically rains in Birmingham on 10 days during the month, with 2.3 of those days involving thunderstorms. Snowfall for the city averages about 0.1 inches for the month, which is pretty similar to January. 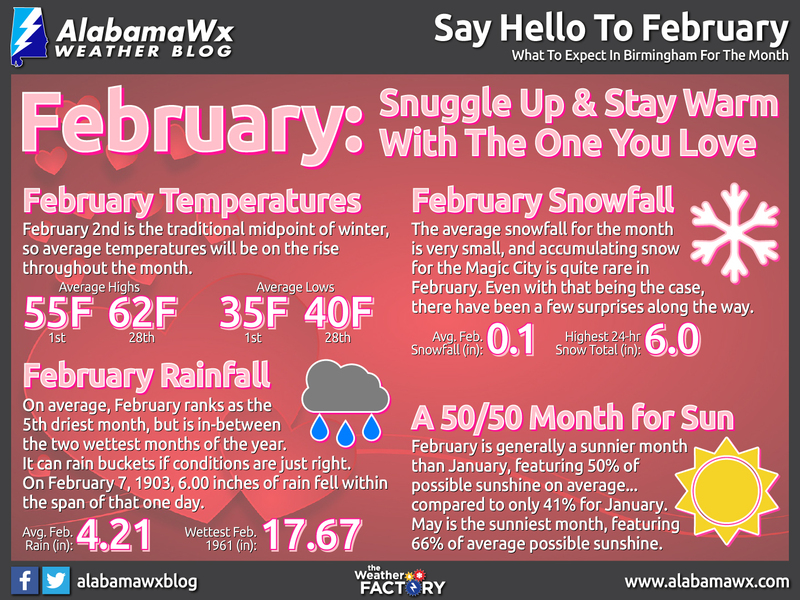 The greatest daily amount of snow observed in Birmingham is 5 inches, way back on February 23, 1901.